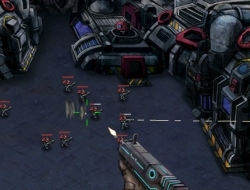 Robots are attacking your base in this miniclip game and you need to defend it. The best way to do this is of course shooting them until they are destroyed. After each wave of attackers you have to spend your money earned to buy equipment, ammo and other upgrades, but if the wall is damaged you should spend some money into repairing it so it will last each wave. The enemies will be getting stronger and you have to keep up with the ever-increasing number of robots charging in. Try to aim for their heads to deal a better amount of damage. Use the mouse to play this shooting game. Robot Shooting 0.00 between 0 and 10 based on 0 votes.